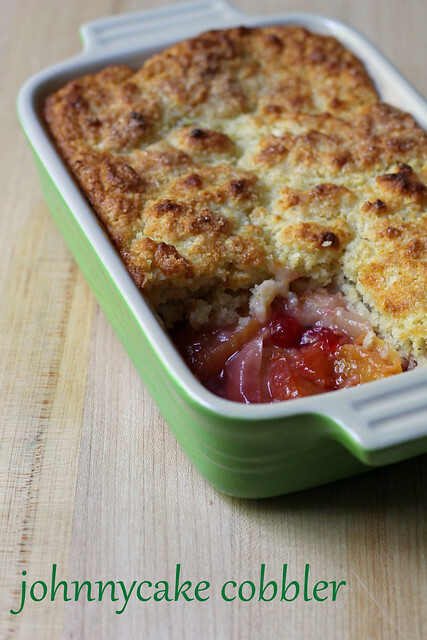 I made Johanne Killeen’s Johnnycake Cobbler twice, both times with peaches and red currants. The first time, I thought the biscuit layer was too thick and the fruit was getting lost underneath all that cornmeal topping. So I tried again, reducing the topping ingredients by a third. Now the cobbler to fruit ratio was in much better proportion. Even with less biscuit on top, in order to get it cooked through, I still had to bake the cobbler for several minutes longer than the recipe stated. I should warn you that the johnnycake topping uses lots of cream. Like lots. I just couldn’t do it– both times, I used a combo of milk and sour cream to replace it (essentially making a higher fat buttermilk-type liquid). I’m sure it was less rich than the original, but at least I could justify having a little scoop of ice cream alongside. I’ve been seeing plums at the market, so I’ll probably be giving this a third try soon! We’re going without hosts now for TWD, so for the recipe, see Baking with Julia by Dorie Greenspan. There’s also a video of Nancy and Johanne making the cobbler together. Don’t forget to check out the rest of the TWD Blogroll! A great recipe.. just in time too! I had issues with the amount of topping as well and really didn’t enjoy it. Glad to see it worked well with less! This looks luscious, I’ll bookmark this is for a make up week. A scoop of ice cream would go so well with this cobbler. i made the crostata but i am thinking i need to make the cobbler too! looks beautiful! I still have to make the cobbler, and will certainly keep in mind the cream amount. I think sour cream makes a much flakiers dough and I like that. Your pics are gorgeous! This is beautiful! I really want to try my hand at making a cobbler, I have never tried yet! Your ratios look to be perfect! There was a lot of dough atop these cobblers. Great tips on making the cobbler, I made the crostata but I will have to give this one a go as well! A much better ratio. I found there was way too much topping. Thanks for the tips on the cobbler – will bear that in mind when I do get around to baking this one. I agree that the original recipe had too much topping. The biscuits were very rich. The headnotes of the recipe suggest pouring heavy cream INTO the cobbler before serving! Can you imagine the calorie count on that? I’ve also reduced the full fat cream and made a mixture of 30% fat and 15% fat. It was still delicious. 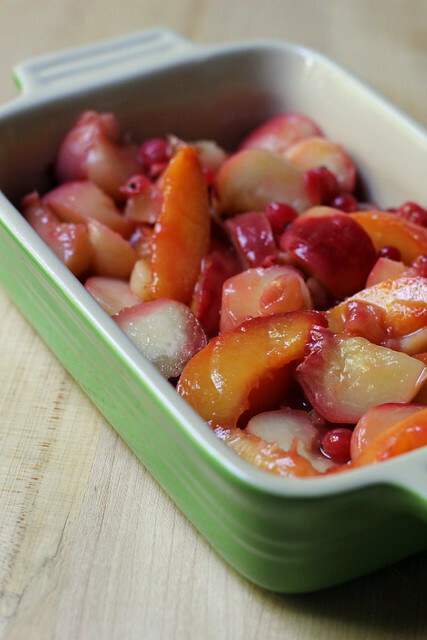 I love your combo: peaches and red currant. We used plums, apples and almond. Much better with less topping! Looks great. Good idea to lessen the topping. I found it too much too. But I also didn’t enjoy the topping either. Nice job! We also felt it was much better, reducing the amount of topping slightly. Red currents sound delicious. We used to grow them in our Northwest garden, and miss harvesting them every Summer. Such a treat. Beautiful! The red currants provide such a beautiful color to the fruit filling. And, yeah, the topping could easily be decreased…there was a LOT! I like your addition of currants. I agree, it’s a lot of cream for the topping. I wonder if replacing half the cream with low fat plain yogurt would work? I do this with scones and biscuits all the time, and actually like the texture better. I bet it would work.